It’s been a year since my last journal update. Where to start? As was apparent from my last entry, my Dad was failing. And yes, he did die, just after midnight on September 7th, 2005, after a lengthy, but painless, period of decline. There was nothing more that could be done medically and he communicated in many ways that he was ready to go, in fact, almost impatient the last few days. I moved into the retirement home the last two weeks and am grateful for the support and many kindnesses of the owners, staff and residents. I was with him leading up to and during his passing, the most difficult and important moments of my life to date. And as exhausting and emotional as that was, I wouldn’t trade it for anything. I felt I was where I needed to be. I am also grateful to my many friends, acquaintances and clients for their patient understanding, love and support, which in many cases came from unexpected quarters. If my faith in humanity ever needed any bolstering, it certainly got it. And losing my Dad wasn’t as catastrophic as I’d feared it might be (for that I’m grateful too); it made sense and felt somehow correct. I took two weeks off to recover both from the loss and the physical strain. I don’t remember much about that period, except I spent most of it at home, doing what I needed to do for myself, whatever that happened to be. Nerves rubbed raw by circumstance, there were some harsh moments with siblings and my Mum, which was unfortunate, but not surprising. We were all at very different stages of grief, all handling it our own way, all sure our way of handling it was the correct way. And it was correct for each us, but not for each other. I found myself biting my tongue with family and needing to be alone even more than usual. And then I went into workaholic mode, one of my methods of coping with extreme emotional stress. Even as I was doing it, I knew it was reactive, a socially acceptable method of avoidance. So I worked sixty to eighty hours a week for several months and by the spring, I knew enough time had passed that I could stop doing that. In my Dad’s last weeks he was mentally in England a lot, the place he went to university and first worked and first married. It was obviously a quickening for him, a time of profound growth and change. One day last summer he said he “wanted out of this snake pit” a reference, I think, more to the situation than the actual accommodation. When I asked him where he’d rather be, he closed his eyes and said rather dreamily, “On the Thames on a Tuesday afternoon.” He wanted to be in England. So I made that happen as best I could. I started planning the trip shortly after his death last fall and finally went in June. I travelled lightly, spending a week in London, staying in one of the residences of his old university, wandering around the Bloomsbury district he had wandered. I devoted Tuesday to the Thames, doing the London Eye, a riverboat tour and walking the embankment. On Wednesday, I took the tube to Ealing, found his old residence (no longer part of the university) and the church in which his friend had introduced him to Bach. I then continued to Kew Gardens and walked along the Thames path to Richmond. And there, on a quiet part of the river, surrounded by lush trees and grasses and birds, I scattered the small film canister of his ashes I’d been carrying with me throughout the trip. And yes, I felt he was so close, even after the tangible remains had been combined with the waters and mud of that old river. I kept asking him for guidance, what I was to do with these ashes. I knew that the busy downtown London Thames on a windy, chilly afternoon wasn’t right. And I let him guide me to the right place, the place he’d intended. And when I reached it, I knew I wasn’t to go into Kew Gardens, but around it on the path. And when I reached the right place, I could feel him telling me that, pushing me to get on with it. And once I had, there was such a profound sense completion, of having done what I’d been asked to do, such a lifting of weight and grief and of things left undone. That’s stayed with me and now I feel I truly am moving forward again. The trip to England continued with a driving tour through Somerset, Devon and Cornwall. I’m proud to say I drove 734.4 miles on English “highways” without serious incident. I have to admit it was a challenging learning curve though. Driving on the left was the easiest part of it; getting used to such narrow roads with stone walls on either side and minimal road signage was much more challenging. But I saw everything I set out to see: Bath, Avebury, Stonehenge, Salisbury, Corfe Castle, Looe, Polpero, St. Michael’s Mount, Boswell, Tintagel, Clovelly, Glastonbury and Wells. I did lots of writing and took lots of photos. And although I never stopped for very long, I came home feeling relaxed, refreshed and regenerated. Since coming home, I’ve also taken my annual trip to the Shaw Festival in beautiful Niagara-on-the-Lake. I saw two plays by G.B., Too True to be Good and Arms and the Man, both very timely vehicles with characters enmeshed in war; both typical Shaw plays, witty and intelligent, funny and pointed. Plays that make you think. I also saw Noel Coward’s Design For Living, a brilliant and honest consideration of a three-way relationship. It’s the sign of great writing when seventy years after the fact, it’s still relevant and all three of these plays are. I also saw High Society, which, after my afternoon wine tour, delivered an appropriate level of fun fluff. And I finally had an opportunity to sample some fruit wines (plum and blackberry), something I’ve wanted to try for years; I was not disappointed. So, another lovely trip. Now that I’m back home for the rest of the summer (with the exception of short trips to the family cottage), I’m writing in earnest again. Well, not in earnest, because it’s a romantic comedy. I’m back working on the novelization of my screenplay Pairs & Artichoke Hearts and enjoying it immensely. An excerpt is posted on the Works in Progress page. Wishing you a fun, relaxed summer to enjoy the company of those you love. This entry was posted in journal archive, Life, Travel, Writing and tagged Avebury, Bath, Bloomsbury, Boswell, Clovelly, Corfe Castle, Cornwall, death, Devon, driving, Ealing, Glastonbury, grief, Kew Gardens, London, Looe, Niagara-on-the-Lake, parents, Polpero, Salisbury, Shaw Festival, Somerset, St. Michael's Mount, Stonehenge, Thames, Tintagel, Wells on July 21, 2006 by admincj. 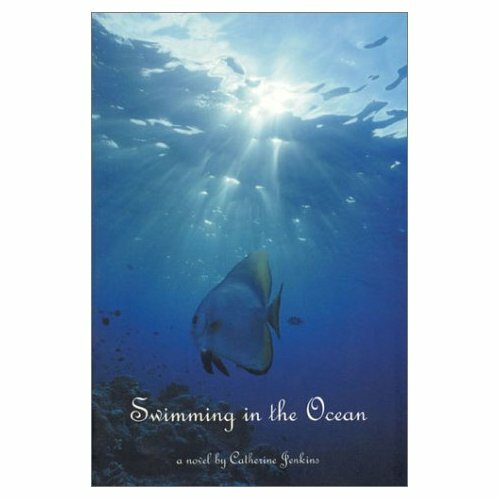 Swimming in the Ocean is about casting off secrets to become free from the bonds of silence and tensions that often hold us back from embracing ourselves. Catherine Jenkins’ debut novel boldly celebrates human resilience and the complexity of emotion in sleek and honest poetic prose. All of the content on this site is protected by International Copyright Laws and may not be used without permission from Catherine Jenkins. All rights reserved.